One of the most popular festivals in the country is Rakhi Purnima or Raksha Bandhan that is celebrated with lot of zest and enthusiasm. Since centuries, Indians have worshipped Rakhi purnima for different reasons in different states of the country. According to Hindu calendar, Rakhi purnima falls in the month of Shravana. This month corresponds to August in Gregorian calendar. The day of Rakhi purnima is considered as the most auspicious day and is characterized as the month of gods and goddesses accompanied with several worships. On this day, in Western Ghats people throw coconuts in water as a form of worship to sea God—God Varuna. This is an important ritual of the day of Rakhi Purnima. Indeed, Rakhi is an offering to Lord Varuna. Due this coconut throwing festival, the day is also known as ‘Nariyal Purnima’. This auspicious day also sets in the season for fishing. In South India, Rakhi Purnima is known as Avani Avittam. Typically, this day belongs to Brahmins. Characterized as the special day for worship and chanting, Brahmins spend the entire doing the puja. With the break of dawn, they take bath in the holy river and change their ‘janeyu’, a holy thread worn across the body especially by Brahmins and men. The process is completed by chanting few ‘shlokas’ from holy books. They pledge to perform all the duties of a Brahmin as laid down in the books and vow to adopt good conduct and dignity. The ceremony is popularly known as Shravani or Rishi Tarpan. Rakhi Purnima is popularly called Kajri Purnima or Kajri Navami in north India. On this day, wheat or barley is sown and Goddess Bhagwati is worshiped. Farmers pray to this Goddess to bless them with bounty of crops. The whole of Gujarat offers ‘jal’—water to Lord Shiva and pray for forgiveness. 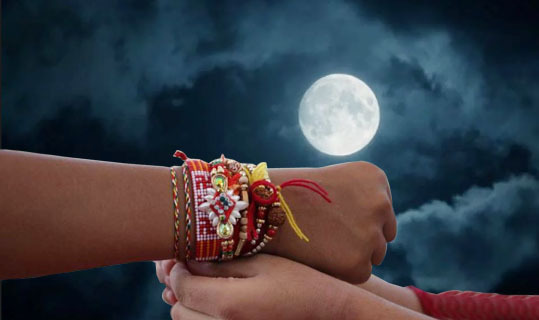 Rakhi purnima is the day when a pious ceremony is observed known as ‘Pavitropana’. On this day, a few filaments of cotton are soaked in mixture of cow's ghee, milk, curd, urine and excreta, called panchagaivya and then fastened around Shiva Linga.